Monkey and Squidge: Everything's coming up Roses! …forgive me bloggers for I have sinned! It's been 17 days since my last blog post and although I've been monkeying around still, dare I say that I have lost my enthusiasm (a little)! 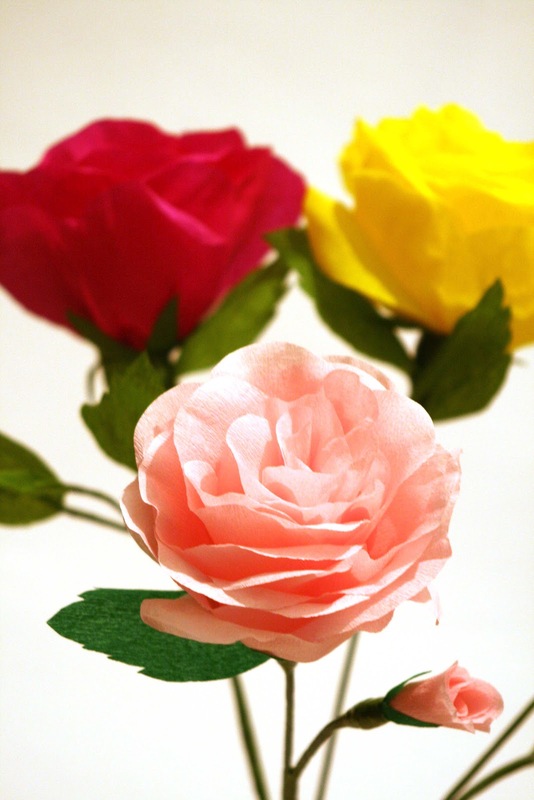 …crepe paper! …and from a fab online florist I find myself purchasing green parafilm and 18 gauge stub wire. So you're getting the idea… no more sewing for me. My bernina is screaming to be used but all I need is a pair of sharp scissors and a pencil (and of course the aforementioned supplies) and I'm off. It started when I came across a blog post on craftgawker about giant paper roses (http://greenweddingshoes.com/diy-giant-paper-rose-flower/) a few days before Valentines day, and I got to thinking. 'I could make my boy one of these for his sweet heart', so I did. I didn't want to make a big one, so I printed a pattern off to fit on A4. My niece and I sat on the floor on the eve of valentines day and both made one, actually I made three, I would say it was because Tink drove me mad asking for one (which she did) but they we're just so easy and fun to make, and the finished item is just beautiful. My boy gave his girl his, and since them I have made another two and cut out a further 4… wanna see them? …can you feel the crepe paper lurve in the room? Oh they just make me so happy. The bright pink one which is in the first photos is for my neighbour, she's such a lovely lady and she is shortly going to have an eye operation so I thought one of these roses may bring a smile to her anxious face! The light pink one (which looks nothing like light pink in the photos) is Tinks' and I added a rose bud just because, and I made the yellow one for me. I have some cream cut out too so I may make a pink and cream bouquet just for fun. Oh yeah, I made a big one too, and I'm going to photograph Tink with it when the weather brightens up. …now comes the fun part! "Girls! (you know who you are) guess what we're doing at our next sewing afternoon." …that's if you can bear to spend an afternoon with me Mrs V, after all, what was it you said? …oh yeah, I remember, it went along the lines of 'I love reading your blog it's really well written and quite funny, I didn't imagine you could be like that because you're not like that in real life' …that was it wasn't it Mrs V?! …and that was before the insult of how boring my hair looked! I think I may be checking your stitches this week and making you unpick any lines that aren't neat enough… that's after you've made a bouquet of a dozen roses!!! …Max, your quilt is looking divine, lovely neat stitching!!! …I've digressed, lastly before I go I just want you to know that the monkeys are still in progress and it won't be long now. This however will be the last batch I make! I will make special requests …maybe, but I really want to get back on with quilting and making my bags. Thank you to Olive & Vince who re-posted me on facebook, if you haven't visited them already you should take a look – very cute! and to Inspiral Silver who featured one of my peg bags on her Folksy Friday – Perfect Patterns page, and a big thank you to those of you who have purchased from me in January and February, I have to admit that I am sad to say goodbye to my Rainbow puffball but I know that it will be loved and become the heirloom it should be. Thanks for stopping by, I promise I won't be gone so long this time. You're so welcome for the facebook post, thanks for the shout out! Those roses are amazing, for a sec I couldn't believe they were made out of crepe paper... Enjoy making more amongst any other creative endeavours :-) we'll enjoy seeing what you come up with.